Originally coined by Jim Cramer of MSNBC, ‘FANG’ is a group of high performing technology stocks that includes Facebook, Amazon, Netflix, and Google (Alphabet). While all these companies started as tiny startups just a couple of decades ago, they have rapidly grown into innovation engines and in the process have delivered stellar returns to investors. Just to put the size of the FANG companies into perspective, as of September 7, 2018, the combined market capitalization of the four companies was USD 2.4 Trillion. This is greater than the market capitalization of all the 30 companies in the SENSEX (USD 2.2 Trillion) put together! Nowadays, the FANG acronym has multiple versions. Some investors added Apple to the list to coin the term FAANG. 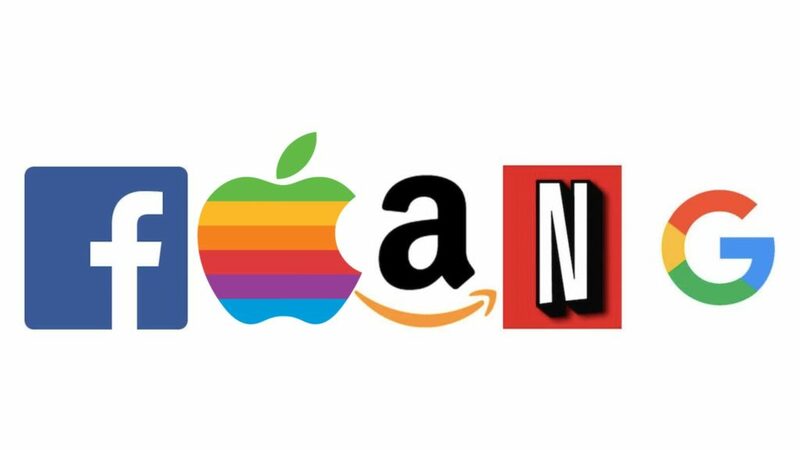 Meanwhile, Goldman Sachs created their own acronym, removing Netflix and adding Microsoft to the mix, to form FAAMG, signifying the top 5 tech companies that have been the primary drivers of growth in the US stock market. Along with its own successful social media platform, Facebook owns Instagram, Whatsapp, and Facebook Messenger. All of these are globally recognized platforms with more than 1 billion users each. Facebook makes the majority of its revenue from advertising. In fact, Facebook, along with Google, is a duopoly in digital advertising. Facebook captures almost 20% of the entire digital advertising spend in the US. The Facebook stock recently lost USD 120 Billion in value primarily due to concerns over data privacy. Despite the stock price hit, Facebook continues to grow its revenue. At the end of 2Q 2018, the company’s revenue grew by 42% to USD 13.2 Billion. A global e-commerce player, Amazon recently crossed the coveted USD 1 Trillion market cap mark for the first time. The company has captured 49.1% of the online retail market in the US and is set to post USD 258 Billion in retail revenue in 2018. One of Amazon’s growth drivers is its cloud computing service called Amazon Web Services (AWS). AWS revenues grew by 42% year on year in 2Q 2018 to reach a revenue of more than USD 4 Billion. It also has an internet advertisement business, which is expected to drive significant future growth and achieve USD 16 Billion revenue by 2021. What are GARP Stocks (Growth at a Reasonable Price)? Apple was the first company in the history of the stock market to hit a USD 1 Trillion market cap. It has the market cornered for smartphones. Despite capturing only 18% of the smartphone volume, the iPhone captures about 87% of the profit margin of the entire smartphone industry. This is in stark contrast to Samsung, which captures only about 10% of the industry’s profit. It also has a rapidly developing internet services business that grew at 31% year over year to deliver USD 9.5 Billion in revenue in Q2 2018. An incredible feat for a mature company. The first global TV provider and pioneer of the subscription model, Netflix has more than 130 million subscribers worldwide. This large subscription base allows it to spread development cost across its users and thus gain a cost advantage over its competitors. Recently, concerns have been raised over the high debt the company is raising to fuel content development, and also around the increasing number of streaming competitors. In the past several years, Netflix has almost always beaten investors’ growth expectations. However, the next phase of its growth is going to be challenging, it missed growth targets for Q2 2018. Satya Nadella, the CEO of Microsoft, has done a tremendous job in navigating Microsoft through a post-Windows world. Led by its cloud and AI practice, the company’s revenue surpassed USD 100 Billion for the first time, in the fiscal year 2018. In its last earnings release, the company announced that its three core business units reported double-digit revenue growth, with Azure Cloud (its cloud services arm) leading the charge by posting 89% year over year revenue growth. The leader in digital advertising, Google has captured 90.5% of the search market. Despite its massive size, Google’s revenue continues to grow rapidly. In Q2 2018, revenue was up 26% year on year to reach USD 32.6 Billion. The company enjoys a leadership in AI technologies, largely due to its massive user base and superb ability to capture and utilize big data to train state of the art machine learning models. Clearly, the FANG/FAANG/FAAMG companies are on their way to revolutionizing how the world interacts with and benefits from technology! In order to become a part of this journey and to invest in these companies, visit Vested – It’s a platform that allows you to invest in US-listed companies like Facebook, Amazon, Google etc. in a cheap and simple way. Viram is an avid investor, engineer and ex-investment banker. He’s currently the Co-Founder and CEO at Vested and is also pursuing his MBA from the University of California, Berkeley’s Haas School of Business.